The word gap – or vocabulary gap as it is also known – is having an enormous impact on our children’s futures. Limited vocabulary prevents children from accessing their learning, developing self-esteem, and enjoying meaningful social interactions, severely affecting their future life chances. And 69% of primary teachers surveyed for the Oxford Language Report Why Closing the Word Gap Matters believe this vocabulary deficit is increasing. 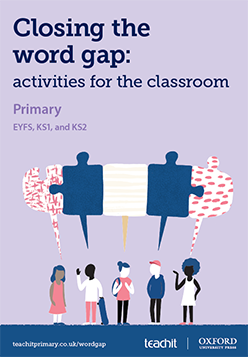 In partnership with Oxford University Press, Closing the word gap: activities for the classroom – primary aims to help schools address this issue. It is free to all, and provides strategies and practical ideas to develop a vocabulary-rich environment, build vocabulary, and foster a love of language from the early years (EYFS) through to the end of KS2. Starting with guidance for headteachers, SENDCos, senior managers, or literacy leaders on developing a whole-school policy for closing the gap, Closing the word gap: activities for the classroom – primary is divided into three further sections (one for each of the primary key stages), each featuring a pick-up-and-go selection of quick activity ideas (ideal for registration, lining up, or those five minutes at the end of the day) and longer session plans and resources. It also includes links to ebooks and relevant resources on Oxford Owl. (Please note that you’ll need to register with Oxford Owl to access these resources.) Each section finishes with a handout for parents with suggested activities, games, and conversation starters to encourage reading, conversation, and vocabulary development at home. Whilst children with special educational needs or those with English as an additional language may be considered more likely to have a word gap, the Oxford Language Report shows that, in fact, this is an issue affecting all children. Therefore, the activities in Closing the word gap: activities for the classroom have been designed to take into account the needs of children from a variety of backgrounds – disadvantaged or otherwise – and can be adapted to suit children at different levels of attainment. The issue doesn’t stop at the end of the primary phase; Closing the word gap: activities for the classroom – secondary looks at strategies and ideas to address the word gap in English, maths, science, geography, and history lessons throughout key stages 3 and 4. With a foreword by Geoff Barton, Closing the word gap: activities for the classroom is free to all and a must for all primary classrooms.